Carte de la Baye de la Table et Rade eu Cap de Bonne Experance. 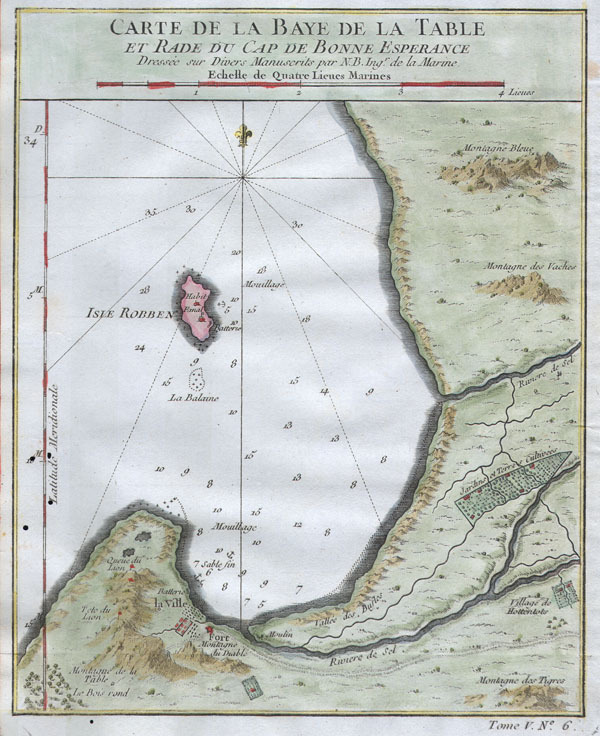 This hand colored map is a c. 1764 map of the Cape of Good Hope and Cape Town, South Africa. Attributed to French cartographer Jacques-Nicholas Bellin, this map was issued for the French edition of Provost's Histoire des Voyages…. Beautifully rendered mountains and villages show the area in considerable detail. Shows the 'Village of the Hottentots,' Blue Mountain, Cow Mountain, Table Mountain, The City of Cape Town itself, Tigerbergen, and many other features. Some oceanic depths are indicated. Of interest is also the Isle of Robben, located centrally on the map. Long a place of exile and punishment, this island prison had a reputation for brutality and cruelty. Today a museum honors the site of so much suffering. Fine or perfect condition. Original platemark visible. Wide clean margins. Blank on verso.